Patrick Roux graduated from the Conservatoire de musique du Québec in Gatineau, where he studied guitar under Jean Vallières. In 1984, he was awarded first prize at the Conservatoire by a unanimous jury. He received a Canada Council grant that enabled him to study under David Russell in London. He has also studied with masters such as Manuel Barrueco, Leo Brouwer, Hubert Käppel, Alexandre Lagoya and Roberto Aussel. Patrick has won awards in prestigious competitions, including first place in the Canadian National Guitar Competition in 1989, second place in the Concours International de Duo de Guitare Classique de Montélimar (France) in 1992 and third place in the D'Addario Guitar Foundation of America International Competition in 1983. At the outset of the 1990s. Patrick began to develop a strong interest in composition. Since then, he has continued to produce works published by Les Productions d'Oz, distributed internationally and performed by leading musicians around the world. The duo Les deux amis and the Contretemps/Go ensemble have inspired him to create a large, unique repertoire that is featured on two CDs. Patrick was a founding member of the Canadian Guitar Quartet, which he played with for 12 years, giving many concerts in Canada, the U.S., South America and Europe. The quartet has recorded three CDs, one of which, Les Scènes de Quartiers, is devoted to Patrick’s music. It received Ontario’s Association des professionnels de la chanson et de la musique’s Trille or award in 2006. Patrick is also a founding member of the G8 guitar octet, which regularly tours Europe and Canada. In 2012, the group released its first record, Between Two Continents. Patrick Roux has been heard many times on the radio, on both CBC and Radio Canada. He has appeared as guest soloist with many well-known orchestras and chamber music groups. Over the years, he has performed his complete series of concertos. 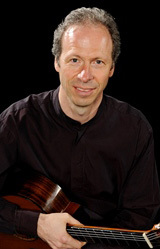 In 1999, he performed the concerto Four Dialogues for Classical Guitar and Chamber Orchestra by the Canadian composer Violet Archer with Ottawa contemporary music group Espace Musique. He has also played for dignitaries such as the queen of Jordan, the princess of Holland, and the prime minister and governor general of Canada. In addition to being very active as a performer and composer, he has taught guitar classes at the Conservatoire de musique du Québec in Gatineau since 1985, as well as being a part-time professor at the University of Ottawa’s School of Music since 1993. Since 1996, he has taught at the summer Domaine Forget International Music and Dance Academy. In 2006, he founded the Guitare Alla Grande festival.